On a day special to 3-time Mornington Cup winning trainer Tony Noonan, the local conditioner again found his way to the winners circle when She’s Positive saluted in the Cleanaway Handicap (1200m) at Mornington’s feature race meeting of the year. But the victory was no easy task for Noonan who has spent the past two months at the barrier trials in a bid to return the 4-year-old Sepoy mare back to the races after her barrier antics drew the ire of stewards earlier in the year. “She’s the hardest filly I have ever trained,” said a relieved Noonan after the win. Jumping from barrier 8 in the field of 9 with Noonan’s son Jake in the saddle, She’s Positive was posted 3-wide the entire journey but had the fortune of finding cover through the run. Coming down the side of the course, Jake elected to make an early move to peel out to make his run but as the field entered the home turn, She’s Positive was pushed 5-wide but still making ground. “She’s got a few antics and attitude but that probably shows when it comes down to the grit and grout stuff in the final 100 (metres),” said Jake after the win. “A lot of credit has to go to Julien Welsh (and) the barrier boys. “They’ve done a magnificent job. They’re an integral part not only to our welfare and the horses welfare. “She’s shown she can go forward and run a race but she was second-up and probably still going to need the run. 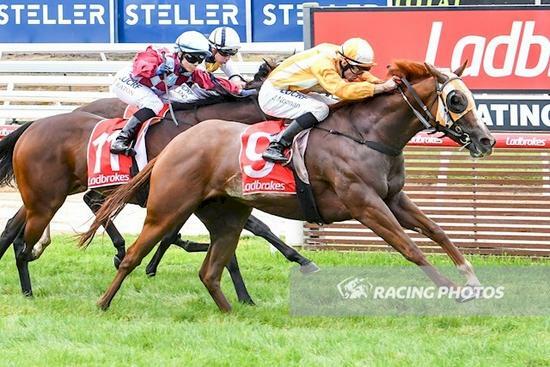 Beyond having won three consecutive Mornington Cups on this day with his warhorse Gunnamatta, the win held further sentimental value to Noonan with She’s Positive being the second foal out of another stakeswinner he trained – Be Positive. The win continued Noonan’s terrific affinity with the family with Be Positive’s first foal, Mr Optimistic (Domesday), also in the Noonan stable and racing in excellent form this prep.